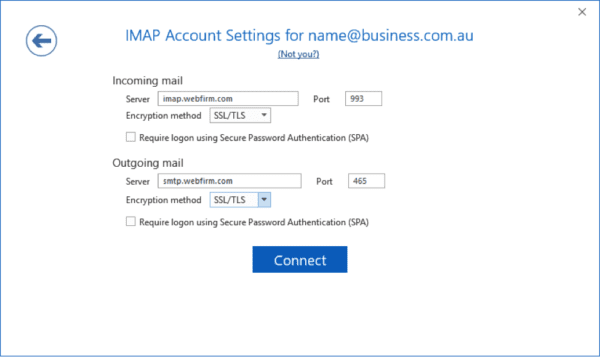 Stuck with how to set up your Webfirm-provided email account? We’re here to help! All Webfirm’s web hosting plans come with basic Email Hosting if you need it. Many of our customers prefer to use professional email solutions like Google’s GSuite (Gmail) or Microsoft’s Office365 (Outlook), but if you just need an entry level solution, we can help! This guide will show you how to get started — how to create and access your email accounts, and common problems with your settings that may happen over time. If all this sounds a bit daunting, the easy way of accessing your email is use Webfirm’s Webmail service, which you can access at https://webmail.webfirm.com. All you need is your email address and your password. 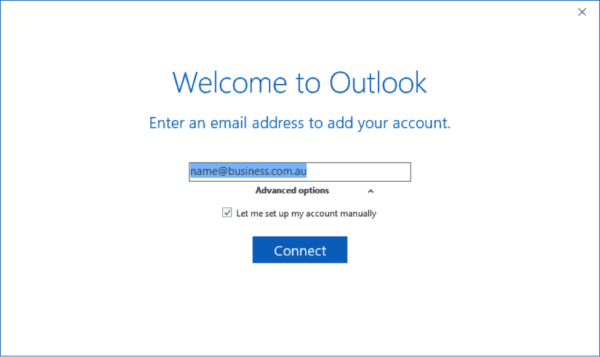 You can find a setup guide for Outlook 2016 below. If you need help with your particular email program or mobile device, please get in touch and we can assist you. How many email accounts can I have on my domain? You can have up to ten email accounts on your Webfirm hosted domain name. It is possible to have more than ten if you have those needs – give us a call or shoot us an email and we can discuss further. 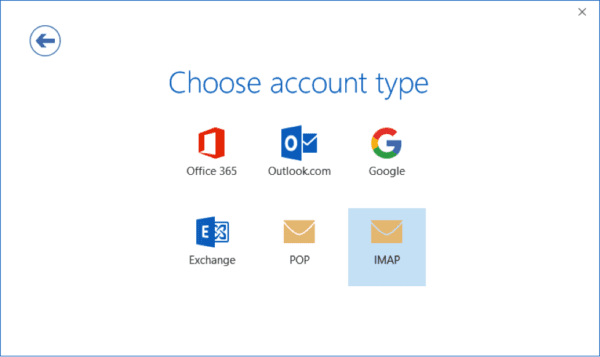 How do I get a new email account created? To get a new email account created, you need to contact the Webfirm team. You can either send us an email at support@webfirm.com, requesting the email address you’re after. Or if it’s more urgent, you can always call us on (03) 9034 5886. How do I get an email account removed? To remove an email address from your account, the best way is to send an email to support@webfirm.com mentioning the exact email address that needs to be removed. There is no forgot password tool, but our friendly team would be happy to assist you. If you have access to another email address, you can email support@webfirm.com and request a password reset. Alternatively, you can phone in on (03) 9034 5886 and we can assist you with a new password. On the settings screen, enter the settings as shown below and click Connect. A login screen should pop up. 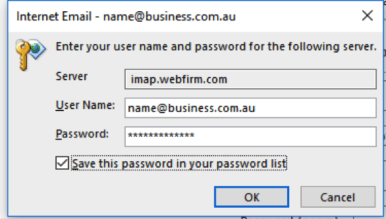 Enter your email address and email account password, tick the Save this password box and then click OK.
You should receive a message saying your account setup is complete! If you have trouble for any reason, give us a call on (03) 9034 5886 and one of our friendly team will be able to help you out.